You PC performance is slow, solve the proble with O&O Defrag. The full serial license key for O&O Defrag 20 now available for free. It lifetime license but not for the latest version O&O Defrag 22. Also available discount for upgrade & buy the latest version. 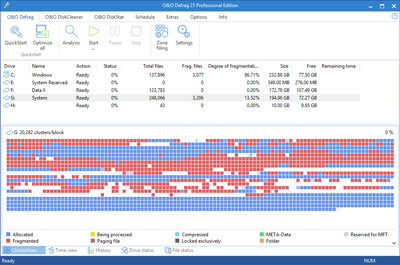 O&O Defrag Professional Edition is a tool to defrag hard disk and make it work at the best performance. It also features with disc cleaner to delete junk files and increase load speed of the hard disk. You can setting up the O&O Defrag Pro to work in the background, so it doesn’t disturb your activity. New version the tool also features with remote control to monitor it from the same network. Normal price the O&O software is $29.95. On this offer download license key or serial number the O&O Defrag 20 for free. Promo Page O&O Defrag Professional 20: Visit the promo page! The developer has released new version O&O Defrag Pro version 22. But the version in this giveaway still good for optimizing Windows system. For users who interested, visit the promo page above. Enter you valid email then click on “Kostenlose Lienz anfordern (Request free license)” button. Confirm your request by clicking the link send to you. After confirmed, you’ll receive download link and serial license key for O&O Defrag giveaway version. If doesn’t receive email within 10 minutes, check your spam/junk/promotions folder. You can download the installer English version of the software from from this link (32-bit) or this link (64 bit). As mentioned above, the giveaway version is not the latest. You can get or buy upgrade license the latest version O&O Defrag 22 Pro with 35% off discount. Buy link for O&O Defrag 22 Professional w/ 35% Off: Click here to buy! New version the hard disk optimization tool only support and works on Windows 10, Win 8/8.1, Win7, and Vista.